Wipe on, wipe off and be WOWed! SONAX Premium Class Carnauba Wax combines the beauty and protective properties of genuine carnauba wax with the durability of silicone ingredients to make one high gloss, highly effective car wax. SONAX Premium Class Carnauba Wax will make your vehicle look fantastic and, most importantly, it will keep it that way with quality paint protection. SONAX Premium Class Carnauba Wax is made with real carnauba wax, the finest natural protectant known to man. With its high melting point and natural UV resistance, carnauba wax is a natural choice for car wax. 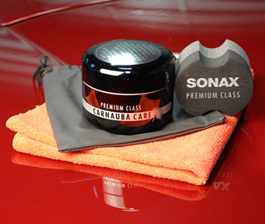 Genuine carnauba wax is the only wax found in SONAX Premium Class Carnauba Wax. 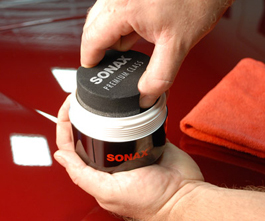 Use the included ergonomic applicator to apply SONAX Premium Class Carnauba Wax. SONAX Premium Class Carnauba Wax enhances any color or type of paint, whether it's a conventional clear coat or a scratch-resistant ceramic clear coat. The high level of protection will keep your vehicle looking cleaner with a deep, lasting shine. SONAX Premium Class Carnauba Wax reduces the adhesion of insects to the paint to keep your vehicle cleaner longer. The silky smooth paint will feel as good as it looks! SONAX Premium Class Carnauba Wax is free of fragrances and contains no artificial filler waxes. Only 100% carnauba is found in every jar! SONAX added silicone components to increase the carnauba's workability and longevity. 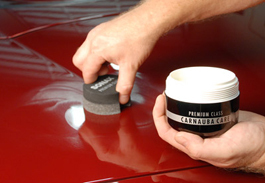 Therefore, you get all the benefits of a carnauba paste wax but in an easy-to-apply formula. Plus, SONAX Premium Class Carnauba Wax is hypoallergenic. It can be applied with your bare hands! Before applying SONAX Premium Class Carnauba Wax, prepare the paint with SONAX Premium Class Paint Cleaner. It will remove anything from the paint that could interfere with adhesion or clarity. Once SONAX Premium Class Carnauba Wax is applied to this clean surface, it will shine more deeply and last longer. Use the included foam applicator to apply SONAX Premium Class Carnauba Wax to one section at a time. This special ergonomic applicator has a unique shape for easier handling and it fits perfectly inside the wax jar. 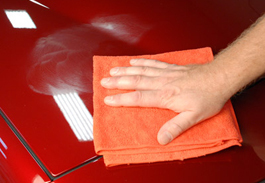 Use the included microfiber towel to gently buff off the wax. Give your vehicle all the benefits of real carnauba wax in SONAX Premium Class Carnauba Wax. Wipe the wax onto one section at a time. Buff off wax with the included microfiber towel. Wax was easy to apply on my white Mercedes. So far it has held up about 6 months. I would describe the shine as buttery as opposed to a mirror like finish. This is a great product and it goes on easily and comes off just as quick and gives great weather protection.